Credit cards are designed for convenience. It is simple to pull out your credit card and pay for a dinner out, the new purse that you have been eyeing or the video game that you have been dying to own. It is easy to make a charge here and a charge there, and before you realize it you owe hundreds of dollars on your credit card. 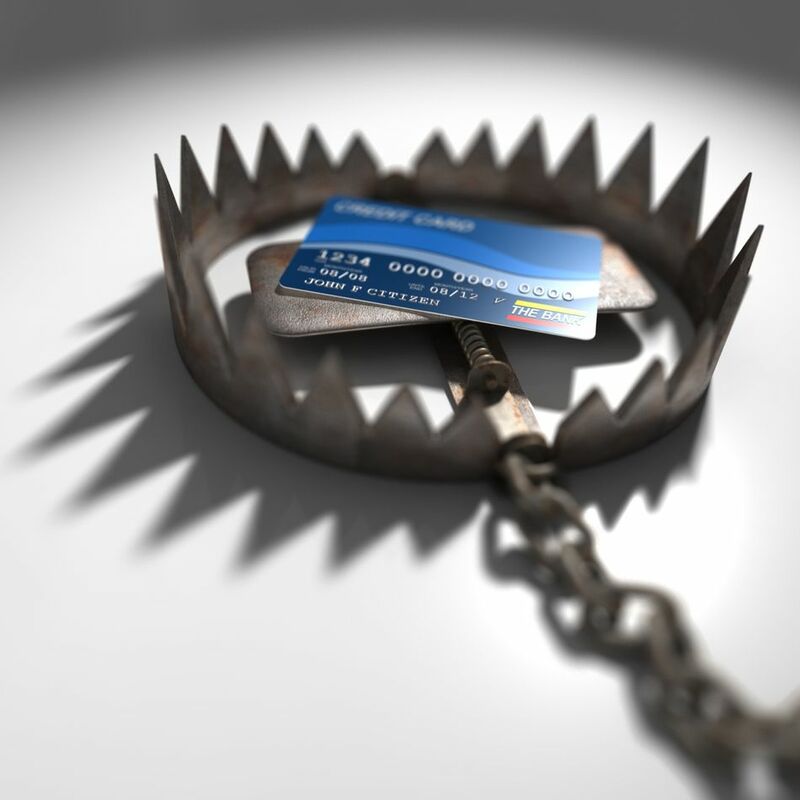 The easy way that you slip into massive amounts of credit card debt is very similar to falling into a trap. There are things that you can do to help lessen the chances of accumulating large amounts of credit card debt. The easiest way to avoid the credit card trap is to simply not use credit cards at all. If you do not have a credit card, then you cannot fall into the trap. If you feel like you need one for traveling expenses, then you can choose to have just one credit card that you do not use except for those situations. It is important to pay the balance off in full each month to make sure you do not have to pay any interest. If you are relying on credit cards, you may need to identify the reasons that you end up needing them. If you do not make enough to cover your bills each month, then you may need to take on a second job. If you are simply overspending, try switching to cash to cover your expenses. You may want to have a credit card for emergencies or to have available when you are having a cash flow issue. If this is the main reason you want to have a credit, do not carry the credit card with you. You can take it with you on trips or when you think you may have a situation that calls for it. Otherwise, leave it at home. This can help you to stop using it for impulse purchases and make sure that you really need the item before you spend the money. The old advice to freeze your credit in a block of ice may be extreme, but leaving your card at home basically does the same thing. You may want to remove your credit card information from the sites that you shop at the most, so it will not just be one click to spend the money. If you use the credit card to earn reward points, and you want to use it for the rewards, be sure to pay off the balance in full each month. You can subtract your purchases from your budget categories so that you monitor the amount that you are spending each month, and you can stick to your budget. If you find that you cannot pay off the balance completely one month, stop using the card until it is completely paid off. This allows you to take advantages of the rewards without paying any interest to the bank. Remember that the reason the credit card companies offer the rewards is because it motivates you to spend, and the bank gets more money since most customers do not pay off the balance each month. If you want to really be rewarded, you should not be paying interest each month. Start putting money aside each month to build an emergency fund. Once you have an emergency fund, you will not need to rely on your credit cards anymore. It is a lot easier to make wise financial decisions and to work on paying off debt when you know you have the money set aside to cover emergencies. Start by saving up between $1,000 to one month’s expenses, and then once you are out of debt, you can build an emergency fund that will cover a year’s worth of expenses. Your emergency fund is one of the best tools to help you stop needing a credit card completely. If you have money set aside to cover things like car repairs or medical bills. It is easier to make wise financial decisions when you know that you have that cushion. Although the idea of getting an extra ten percent off on each purchase with a store credit card can be appealing, it is a lot easier to fall into the trap if you have multiple credit cards that you are juggling. It is easier to miss a payment and to have a hard time making your payments each month. If you want the discount, many stores are now offering a debit card option that can help you avoid running up a balance. You can make this easier by avoiding store credit cards completely and choosing to have just one credit card that you use. This will help to limit any damage that you may have and make it easier to take control of your situation. You can begin closing your credit cards, as you pay them off. However, you should leave your oldest credit card open, and maybe the one with the best interest rate. This will help you keep up your credit score.